Happy Labor Day weekend! Due to my knee surgery this week, I am beyond bummed to be missing out on all the festivities this weekend! 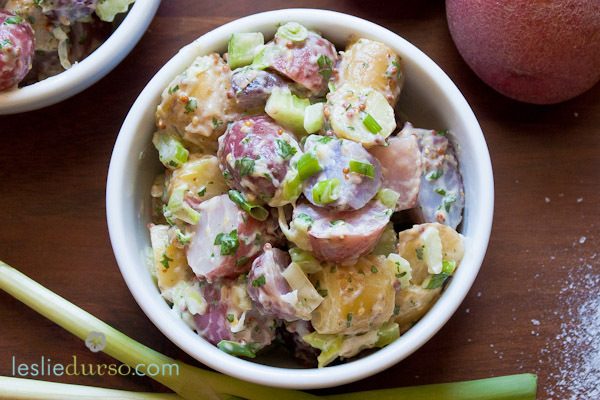 Promise me you will have enough fun for me as well 😉 Today I thought I would share another one of my potato salad recipes. Yes, I know I have shared like 5 this Summer, but what can I say, I love potatoes! This one is different because of the addition of whole grain mustard and green onions. It’s super yummy and gives it a nice tang! I also use Just Mayo in here which is a new eggless (vegan) mayo on the market and I just love it! You can find it at basically every grocery store in the country including Whole Foods, Costco, Target, and Walmart. Give it a try this weekend and let me know how it goes! Boil potatoes until fork tender. Drain and chill. Cube the cooled potatoes and mix all the ingredients together.